The Honourable Paul R. Bélanger, Commissioner of the Elliot Lake Inquiry, released his report on October 15, 2014, in Elliot Lake, Ontario, the site of the collapse of the Algo Centre Mall. It was transmitted to the Attorney General, the Honourable Madeleine Meilleur, shortly before the public release. 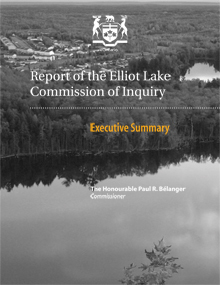 PLEASE NOTE: A corrigendum has been added to Chapter 14 of the Report. It notes that the Commissioner's recommendations relating to the enforcement of minimum maintenance standards for buildings need to be passed by the legislature and cannot be implemented by an order in council. 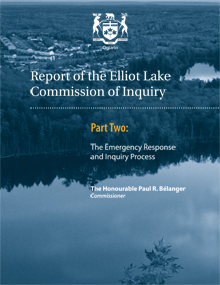 Copies of the Report can be obtained through ServiceOntario Publications by calling 1-800-668-9938 or at www.serviceontario.ca/publications.